and led by your steady hand. So that I can bloom where I’m planted, for you, Lord! and be dressed with your dressings. inspiration to all for you. But I fall short miserably! and a miracle of His mercies! 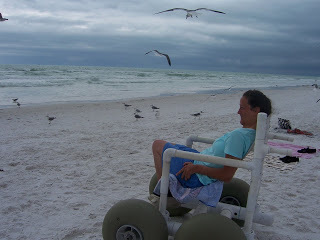 Rosene loved the beach – she loved the smell, the wind, the sounds and the vastness of it. In the summer it was a New Jersey beach and in the winter a Florida beach. 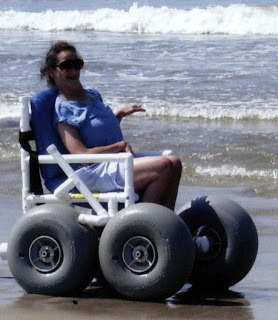 She was always happy to transfer from her wheelchair to the lifeguard’s beach chair because that meant she would be able to get much closer to the water. Thy Word is a Lamp unto my Feet and a Light unto my Path!! It is so incredible that the Lord delights in me! How ironic that he’ll rejoice over me with shouts of joy. for you to live and suffer with us and die for me. We turned it into conditional love. I will give thanks to you, Oh Lord. Your love is so deep! When I cry, you weep! You are there and comfort me!!! How priceless to be a precious child that delights in the Lord! God’s love is forever and always the same! It doesn’t depend on your looks or your name. How incredible is that thought! by you our desires are satisfied. ← My Sister Rosene – What is Normal? I've been reading about your sister this morning and have been so inspired. My prayers are with you this week as you remember and rejoice that she is no longer confinded to her earthly body, but is running, singing, sitting quietly with her Father. And yet I know that your heart still breaks because she is not with you. May God continue to offer you comfort.